In this example I will show how to complete the zoning for a two Host ESX Cluster (ESX01 & ESX02), using a dual Fabric connecting to a EMC VMAX 10K Dual Engine SAN. 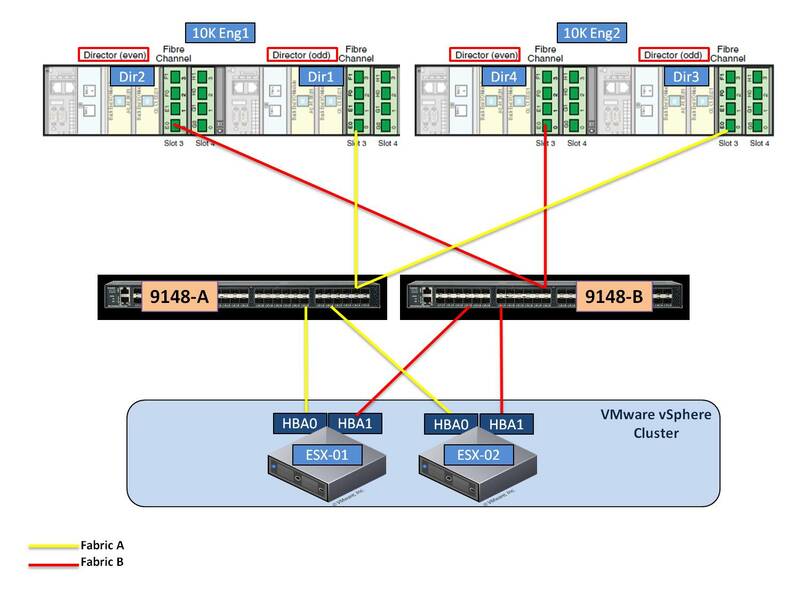 As can be seen from the image below this configuration will provide redundancy for the ESX host on both HBA’s as well as on the Switch and VMAX levels. 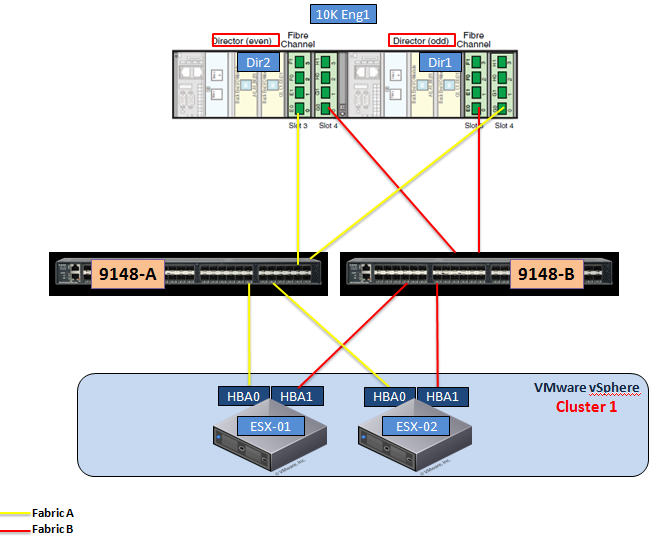 This example will detail Zoning the ESX Cluster Hosts to front-end ports on a VMAX10K (2xEngines/4xDirectors) using FA ports 1E0,2E0,3E0,4E0. The Best Practice for the VMAX10K, if beginning with 2 or more engines, is to assign a cluster across 2 VMAX Engines, one port per director for a total of 4 ports. Each VMAX Engine will have connectivity to each SAN Fabric. ◆ Odd directors are connected to Fabric A (1E0,3E0). ◆ Even directors are connected to Fabric B (2E0,4E0). A good rule of thumb is to use all the “zero” ports on directors first before utilizing the “one” ports –Go wide before you go deep. Single-initiator-single-target is the preferred zoning practice. Note: EMC always recommends using one initiator and one target in each zone. By using VMware ESX Servers with multiple physical HBA’s and connecting to multiple directors in different engines this will benefit I/O intensive workloads and will increase redundancy. Balancing accross resources is always the best approach. This is an example configuration and it is always advisible to utilize the EMC tools available to help determine your exact required configuration. From such a configuration if a switch failure occurs then we lose half the ports on each director but at least both directors can cater for the workload as opposed to one director. In my shop we like to connect and zone each hba to even and odd director, with 2 or more engines it does not provide any additional redundancy but we adapted this approach anyways. On fabric B, is there a reason why you are using vsan10 and not vsan 11 on the zones? Thanks a Million! after been searching for this solution for weeks. Great article, implementing a single engine VMAX as we speak and am curious to know if the design changes such that a single director should have all its ports on fabric A while the other director having all its ports on fabric b? working with a vendor that suggests that approach but it seems to make better sense in my head to split the ports on odd director to have 4 ports on A and 4 ports on B and same for the even director? Added single engine scenario as per our twitter chat !